Qtractor is an MIDI and Audio multi-track sequencer. It was written programmed in C++ with the Qt4 framework . 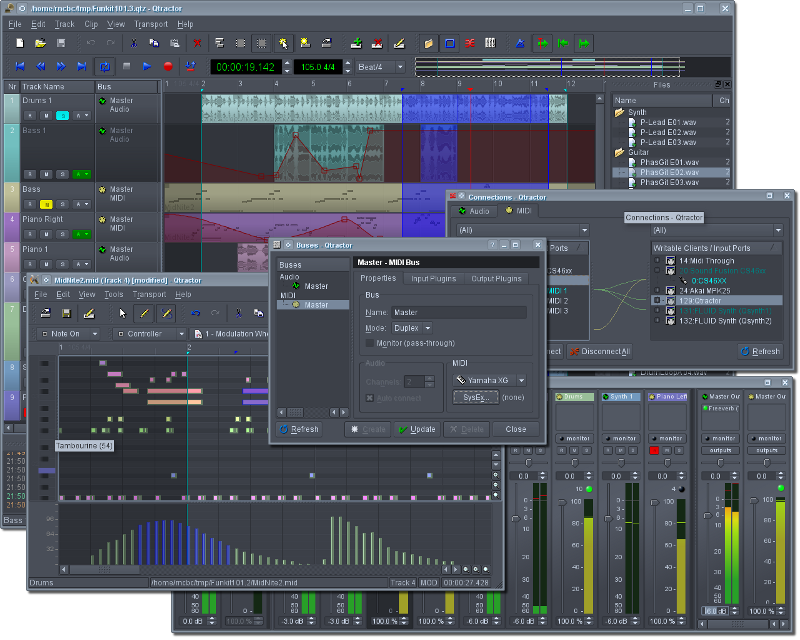 Qtractor is designed for Linux, compatible with the prominent Jack Audio Connection Kit (JACK) for audio  and the Advanced Linux Sound Architecture (ALSA) for MIDI  infrastructures. This is created specially for people who do personal home recordings. Developed on pure Qt4 C++ application framework  (no Qt3 nor KDE dependencies). Uses JACK  for audio and ALSA  sequencer for MIDI as multimedia infrastructures. Audio file formats support: OGG (via libvorbis ), MP3 (via libmad , playback only), WAV, FLAC, AIFF and many, many more (via linsndfile ). Built-in connection patchbay control and persistence (a-la QjackCtl ). LADSPA , DSSI  and native VSTi  plug-ins support. Audio clip time-stretching (WSOLA-like or via librubberband ), pitch-shifting (via librubberband ) and seemless sample-rate conversion (via libsamplerate ). MIDI clip editor (piano roll). Introducing LV2 UI Show interface support for other types than Qt, Gtk, X11 and lv2_external_ui. The common buses management dialog (View/Buses...) sees the superfluous Refresh button finally removed, while two new button commands take its place: (move) Up and Down. LV2 plug-in Patch support has been added and LV2 plug-ins parameter properties manipulation is now accessible on the generic plug-in properties dialog. Eye-candy warning: muted/non-soloed tracks are now shaded over the main thumb-view. Faster and crispier VST plugin editor (GUI) idle cycles. Improved Mixer multi-row layout (patch by Holger Marzen aka. bluebell, thanks). Added one decimal digit to all percentage input spin-boxes on the MIDI Tools dialog. Try making Help/Shortcuts... dialog window modeless, as far as under MIDI Controller, Inputs/Outputs Connections window also gets accessible enough. Added brand new and global option to disable the so called "catch-up" default behavior (cf. View/Controllers.../Sync). Added one decimal digit to the Pitch-shift spin-box on audio Clip/Edit... properties dialog window. Added application keywords to freedesktop.org's AppData. Fixed some track control issues related to MIDI Controllers generic mapping (cf. View/Controllers...). Fixed some vertical scrolling and play-head line re-drawing glitches introduced by the recent unlimited slack to editing beyond current contents length on main tracks view. Fixed local keyboard shortcuts on the Files organizer widget actions and context-menu. Fixed all core processing when any plugin has more audio outputs than channels on a track/bus where it's inserted. Fixed the Ctrl+drag/cloning left of a clip when towards near the beginning of session. Extended track multi-selection for mute/solo. Bugfix for initial session snap-per-beat setting on main toolbar. Many more enhancements and bugfixes. Change Time display format (frames, clock-time or BBT) from the context-menu on any time entry spin-box. LV2 plugin support tied better to liblilv; also applies to LV2 plugin UI support and libsuil and vice-versa. Mixer buses racks (ie. left/input and right/output panes) are kept fixed-width when whole mixer window is resized. Unconditional LV2 Dyn(amic)-manifest support has been added. Automation's back in effect on Track/Export Tracks.../Audio. Color selection actions now have a brand new palette icon. Make sure main track-view and MIDI clip editor selection is only cleared on specific discrete commands. Try keeping the original session file in most recent files menu list, despite current version auto-incremental backup mode is in effect. Fixed non-zero clip offsets upon tempo/time-scale changes. Some sympathy to extreme dark color (read black) schemes is now indulged on empty backgrounds. New Main track-view Edit/Insert,Remove/Range dialog applicable to Clips, Loop, Punch in/out, Automation, Tempo-map and/or Markers. Andy Fitzsimon's original icon from opencliparts.org makes it through as the default standard scalable format (SVG). Improved precision tolerance on the Tempo Map / Markers dialog. MIME Document types and icons. Now with French and Japanese translations. Auto-monitored MIDI tracks were missing their pass-through to their respective MIDI output bus plugin chains, now fixed and letting any multi-timbral instrument plugin to get a peek from auto-monitoring. New user option/preference to whether to open a plugin's editor (GUI) by default, when available (cf. View/Options.../Plugins/Editor). Clicking and/or dragging for rubber-band selection on main track-view canvas doesn't change the edit-head and -tail positions anymore. Backward and Forward transport commands now have an additional stop at first clip start point. LV2 Atom/MIDI buffering support is finally entering the scene; LV2 Worker/Schedule support is also included in a bold attempt to convey non-MIDI event transfers between plugin and its UI. MIDI Clip editor (aka. piano-roll) and MIDI Tools fix: avoid note-on events of zero velocity, which conventionally equates to a dangling note-off event and dropped into oblivion sooner or later. There's no more need for Shift/Ctrl keyboard modifier to change in one single step all the MIDI events that are currently selected (now consistent with drag-move). LV2 Presets support now entering effective operational status; a new local option has been added (cf. View/Options.../Plugins/Paths/LV2 Presets directory; default is ~/.lv2). Dropped XInitThreads() head call as it was never useful but on those early days of JUCE VST plugins. Italian (it) translation added (by Massimo Callegari, thanks). Clip fade-in/out dragging now follows snap-to-beat setting. Late modern eye-candy indulgence: alternate shaded stripes, on every other bar as in a "zebra" background option for the main tracks and MIDI clip editor views (cf. View/Snap/Zebra). LV2 Time/position information is now being supported through special designated plugin input ports (after suggestion by Filipe Coelho aka. falktx). Additionally, the time/position information report has been corrected and complemented for VST plugins. Audio vs. MIDI time drift correction has been slightly improved against rogue tempo changes across looping cycles. Honor tempo/timing on MIDI instrument plugins. Happy regression fix on getting MIDI note-offs at looping ends back in business; all the necessary bumming for MIDI plugins to play nice in face of tempo changes and whenever playback is started from anywhere but the beginning of the time-line (ie. frame zero); thanks to rvega aka. Rafael Vega, for the heads-up). LV2 Programs interface is getting initial experimental status, to let LV2 instrument plugins get on par with the DSSI and VST crowd for MIDI bank/program instrument inventory and selection support (a sidetrack complot with Filipe Coelho aka. falktx, thanks:). Dropped the old but entirely useless LV2 URI-unmap feature, now being superseded by official LV2 URID (un)mapper. Russian (ru) translation added (by Alexandre Prokoudine, thanks). SLV2 deprecation process started, effective now at configure time. Added include to shut up gcc 4.7 build failures (patch by Alessio Treglia, closing bug #3514794). Another approach avoiding recursive observer widget updates. Also applies to mixer, monitor and track state buttons. Update to latest LV2 state extension (by David Robillard, thanks). Loop-recording/take number displayed on clip title, respectively. A one buffer period slack on audio engine's loop turn-around logic might just have fixed an illusive report on loop-recording/takes going progressively out-of-sync, most notably when recording under large audio buffer period sizes (>= 1024 frames/buffer). Editing MIDI while playback is rolling, doesn't mute the track any more, adding a point to the live editing experience. Finer granularity for direct access parameter mouse wheel changes. Dropped a dumb optimization for short full-cached multiple linked /ref-counted audio clips which were incidentally out-of-sync after rewind/backward playback. Once again and uncertain to be the last take on this, got fixed (probably related to some oddity reported by Louigi Verona, thanks). Improved native Linux VST support, generic plugin form and JACK session support. Mainly a big fix and optimization release. Yes, you've read that right. Big. Some earthquake-bound changes have sneaked in and all under the hood. Most are bearable visible, if at all. Quite frankly, the most time-critical code paths have been subject to some kind of a deep overhaul, and to say the very least, might get only noticeable while loading hugely complex sessions. Whatever that means. In other words and put simply, there are gentle performance wins and nice resource savings. MIDI controller mapping/learn is now possible on all mixer controls (monitor, gain, panning, record, mute, solo). An internal rewrite (aka. refactoring) have been carried out, making sure that all track state action buttons (R, M, S) are now all under the observer pattern umbrella. Single track range selection is now available on main menu (Edit/Select/Track Range; default keyboard shortcut: Ctrl+Shift+R); additionally to vertical range and horizontal track actions (Edit/Select/Range, Track) all these operations can now toggle over the previous selection. Direct clip selection from Files list item has been brute-forcefully implemented (after being challenged by Jiri Prochaszka aka Anchakor:). Files tree widget sticky "New Group" item fixed. A new menu option has been added (View/Tool Tips) to show/hide a floating tool-tip while dragging, moving, resizing or pasting selected clips or events over the main tracks view and MIDI clip editor (piano-roll) respectively, displaying current target position and status. Attempt to reset audio/MIDI time drift compensator on every engine start and loop turnaround. Moving the punch-out marker over the main track time ruler was failing to shrink the punch-in/out range, now it does (not). MIDI clip tools (quantize, transpose, normalize, randomize, resize, rescale and the new timeshift) are now all accessible from the main tracks view (Edit/Clip/Tools menu) and apply to all events on current selected clip(s). LV2 Persist extension support is being introduced. A new timeshift MIDI tool has been added, after an awesome patch by Jiri Prochaszka aka Anchakor; applies to selected events between edit markers, distorting their time and duration (optionally), either slowing down and accelerating, based on a given parameter P value. Audio clip/buffer pitch-shifting fixes with regard to latency correction due on the RubberBand library one-pass (real-time) processing mode. New Send Gain and Dry/Wet control parameters have been implemented for audio Inserts pseudo-plugins. MIDI channel/master volume enqueued events are now affected by the current track/bus volume (0-100%). Prevent old rounding error when resetting to plugin parameter default value with the mouse middle-button click while hovering a slider widget (observer). A quantize percentage has been added to MIDI clip editor quantize tool (Tool/Quantize...) for time and duration quantization (0% for none; 100% for full regular quantization). Metronome bus/ports are now created at engine start and not when user switches it on anymore. Make sure all audio clip buffers are in sync upon smooth-ramping going off and playback is rolling. Copy-pasting across controller event types is now possible on the MIDI clip editor (aka piano-roll). Finally indulged, the genuine transport stop button makes its appearance on main toolbar and menu. Main tracks grid visibility option (View/Snap/Grid). Yet another off-by-one (frame) audio buffer bug got squashed away: rare symptom was that some audio clips were being left dead silent right after playback of their first looping period. Plugin parameter name/label now a proper attribute of its respective MIDI Controller observer instance, allowing to be shown on dialog title (MIDI learn). Default session file format saved on JACK session demand is now the bundle archive/zip one (.qtz). Plugin selection dialog now shows whether a plugin features its own editor (GUI) and/or external state configuration (EXT). Help/Shortcuts... window positioning and sizing are now preserved. All plugin chain changes over the track properties dialog now sure counts as a dirty action (possibly fixing bug #3104129). Newly extracted archive/zip session directories are now removed automatically from the file-system on session close, prompting the user for confirmation (cf. View/Options.../Display/Confirm Removals). Ctrl+mouse-wheel is now set for zooming in/out, on main track-view and all applicable MIDI clip editor views (piano-roll), according to current zoom mode (see View/Zoom Horizontal, Vertical or All for both ways simultaneously). New MIDI clip editor (piano-roll) mouse hovering effect (eye-candy++). After too many a user request, a brand new session archive file type is being introduced (.qtz) which tries to bundle in one single zip archive all the media and contents of a session. Add that to eye-candy: either loop or punch-in/out outer ranges are now shaded on the main track-view, thumb-view and MIDI clip editor (piano-roll) views. LV2 GTK UI plug-in hosting is now roaring its ugly head (EXPERIMENTAL). Ignore all initial and decremental notifications of audio engine's buffer-size changes. Internal audio buffer loop points were not being set properly for non-zero clip offsets, leaving some as severely out-of-sync while rolling over loop turns. Now fixed again, hopefully. Avoid audio peak file clashing when deriving from audio sample files with distinct absolute paths but the very same file (base)name. A new MIDI editor (piano-roll) tool has been added: Rescale event times, durations and/or values by a percentage between 1 and 1000% (adapted thanks to patch #3081954, by Jesse Lucas). Attempt to mitigate audio clip sequencing glitches on single-core/single-thread machines. ready for the so-called and long-awaited "MIDI Learn" feature and arbitrary MIDI controller assignment, for plugin parameters in particular.